Bring delicious freshly filtered hot and cold drinking water right into your office. Try one of our systems and start enjoying the convenience of unlimited refreshing filtered water at a fraction of the cost of bottled water. Don't want to have to lift bottles? Try our Bottle-less Water Filtration Coolers. A water line is run from your existing water supply into the back of your cooler. The water is then filtered as it flows through the tap and into your glass. You get water-on-demand assured to be clean, crisp, and odor free. It filters out chlorine and other minerals. Plus with a hot and cold temperature choice, you’ll always have perfect water. Laurel Foodsystems is ready to deliver everything you need to satisfy your thirst right to your door. We make it convenient, save you money, and stand behind our products. Bottleless water coolers work by applying sophisticated purification methods to the tap water already available in your office. Also called filtered or POU (Point Of Use) water coolers, bottleless coolers eliminate the need for clunky, expensive, and antiquated bottled water. Let us show you how our drinking water delivery services are different. We don't require water bottle delivery trucks to bring the water into your office water cooler. Our water delivery is straight from your own water supply, using purification technology to remove harmful impurities and allowing you to skip the plastic water taste altogether. Alpine filtered water is better for you and the health of your valuable employees! "Our water coolers act like mini filtration plants in your office, providing you with the cleanest, best-tasting drinking water at the lowest cost without any of the traditional headaches or health issues of bottled water. At the same time you'll be making a positive impact on the environment. 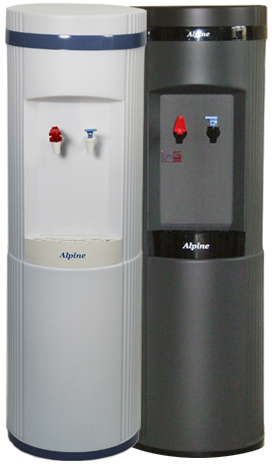 Installing Alpine's filtered water coolers is one of the best "go green at work" solutions your company can make." These sleek and stylish water coolers with hot and cold faucets are available as floor units and countertop units to conserve space. Alpine's patent pending in-tank UV system sanitizes water as it enters the reservoir, and a nightly sanitization cycle further prevents the growth of algae, biofilm and pathogenic bacteria. All Alpine equipment is tested and certified by the Water Quality Association so you know you're getting the very best. "UV water treatment offers many advantages over other forms of water treatment for micobiological contaminants. Most importantly, it does not introduce any chemicals to the water, it produces no bi-products, and it does not alter the taste, pH, or other properties of the water. Accordingly, in addition to producing safe drinking water, it is not harmful to your plumbing and septic system. Further, it is easy and cost-effective to install and maintain without any special training." This is a process that exposes water under pressure‚ to a semi-permeable membrane with a very fine pore structure. Because most inorganic contaminants are of a larger molecular size than water‚ the membrane rejects certain contaminants‚ minerals and a large part of the water. The portion of water that passes through the membrane is stripped of inorganic compounds and trace minerals. RO is needed in areas with high total dissolved solids (TDS) in the source water. These areas are primarily located in mid-western and southwestern states where the water source comes from aquifers vs. ground water i.e. lakes and rivers. It reduces: Arsenic, cysts (cryptosporidium, giardia, entamoeba and/or toxoplasm), barium, hexavalent chromium, trivalent chromium, copper, lead, fluoride, cadmium, radium 226/228, selenium, TDS and turbidity. RO systems are either a 3- or 4- stage system depending on the holding tank. › The first stage is a 5 micron Sediment filter that traps particulate matter like dirt, rust and silt. › The third stage is the heart of the RO system or the Membrane. This 50 gpd semi permeable membrane removes TDS, Sodium, Percolate, Chromium, Arsenic, Copper and Lead. It also removes cysts such as Giardia and Cryptosporidium together with Nitrates and Nitrites. › The fourth stage is needed to clean the water after it passes through the holding tank. If using a cooler with sufficient reservoir space no holding tank or fourth stage filter is needed. "Reverse osmosis, also known as hyperfiltration, is a process that reduces the particles down to the molecular level. The same process used by major bottled water companies, reverse osmosis reduces the salts and other impurities, giving you high quality great tasting water. This five-stage system provides an affordable alternative to bottled water, conveniently located right in your office."